Now that you have decided on a sugar glider as your pet you should have all the supplies necessary before bringing him home. 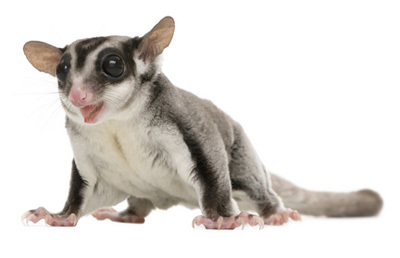 A safe and enjoyable home will help you have a happy and healthy sugar glider. This care sheet will guide you in having everything you need. A properly ventilated cage no smaller than 20″ x 20″ x 30″. Sugar gliders prefer tall cages and always get the biggest cage possible. Bird cages make excellent glider homes. A nesting box for sleeping. A cloth pouch, birdhouse or hamster house work well. Bedding made of shredded plain paper, recycled paper bedding, or wood shavings. Primarily to collect waste at the bottom of the cage. Heavy flat bottom dishes or bowls that attach to the side of the cage for food. Heavy flat bottom dish or stoppered drinking bottle for water. Climbing branches. Sugar gliders love to climb. Bird toys, perches, ladders, a hard bone for chewing, tubing for hiding or exploring. It’s always good to have items that keep your pet entertained. A source of protein like cooked meat cut into small pieces, tofu, cottage cheese, or yogurt. Live insects like mealworms and crickets as well as raw unsalted nuts that can be given as treats. A multivitamin and calcium with d3 supplement. There are reptile supplements that work well for sugar gliders.